yiannis krikis (thessaloniki, Greece) on 19 May 2008 in Cityscape & Urban and Portfolio. As usual - a wonderful image. I like the division in this one. The top is ornate and busy and the lower part is simple and "quiet"
Wonderful bw, very soft tones, great lines and geometry.. the solitary bicycle is really cool there..
this is an amazing shot .. great composition and nice elements put together. Wow! Love the composition! I like the solitary bike and the great details at top. A beautiful work! 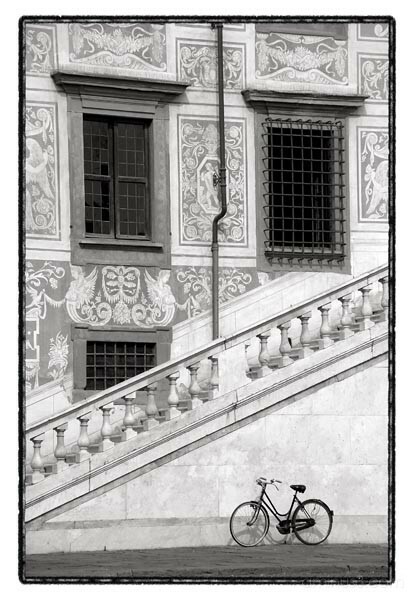 The place of the bike, the diagonal of the stairs, the vertical tube, the black windows, all these elements create the very special rythmn of this remarkable composition. I really like this. The detail on the wall and the simplicity of the bike sitting there. Very nice. WOW! lovely shot! thats very nice! nice composition on this. i like how the lines flow. Lovely location and well composed. Me gusta mucho la composición con la escalera en diagonal!! The bicycle makes it . . but you knew that, of course! Great image. I really like all of the competing lines. Amazing composition and great tonal range.. Beautiful picture! Very graphic picture and superb composition, very well balanced. Beautifully composed shot. Excellent framing and details here. Like the design and architecture, great image. Very nice architectural shot. The small frame of the bicycle reinforces the strength and permanance of the massive architecture.. Brilliant... absolutely brilliant!! I think the bicycle is what gives this image it's perfect balance. What a great image. Simple and effective and great B&W. Nice balance in this shot. The bicycle adds alters the scale perfectly. Good subject for B&W as well. Oooo....I love it ! That ornate staircase with such a simple bicycle at the bottom. How intriguing. Classic and beautiful with added diagonal interest. Great shot. Very nice tones and textures. I like the sense of scale that the bike creates. I really like this composition - It's just, perfect! there are really lovely lines and textures in this mate, but the in my opinion it is the bike that truly grounds this capture. fantastic!